In times of restraint like these, Health Minister Hoskins and Premier Wynne need to stop spending money on organizations like LHINs that have served no useful purpose for the general public in over 10 years of existence. The funds need to be re-dedicated to front-line health care so that we can address the growing needs of the populace. Over the past few months, much has been written about Ontario's Local Health Integration Networks (LHINs). But what exactly are they? How do they relate to the average person? What role do they play in health care? What's their purpose? LHINs were founded in 2004. What most people forget is that they replaced District Health Councils (DHCs). The DHCs were advisory health care planning organizations, funded by the Ministry of Health (MOH). The Canadian Human Resource Network stated that they were developed based on the premise that community members can best determine local health needs and priorities. According to the South West LHIN home page, LHINs are supposed to be advisory health care planning organizations funded by the MOH. LHINs are based on the principle that community-based care is best planned, coordinated and funded within the local community because local people know their health service needs and priorities best. Well, all right then. That's a big difference. One wonders exactly why (and how much) taxpayers' money was needed to pay for all of the rebranding necessary to change from a DHC to a LHIN. As an excellent piece on health care, Longwoods.com points out that LHINs were initially thought to lead towards the formation of some sort of Regional Health Authority (RHA), similar to other provinces. However, they were hampered in that none of the governance roles provided by thousands (yes, thousands) of specialty health care providers were disbanded. So despite adding a LHIN, the traditional governance structures both inside and outside the MOH remained. In effect, rather than these organizations reporting directly to the ministry, they reported to the LHINs, who then reported to the ministry. What's worse, however, is that unlike RHAs in other provinces, the LHINs were NOT given control over delivery of health services. But they had to be accountable for system co-ordination and management. In effect, they became a DHC with a new and improved logo, extra money and more paper reporting -- but not much else. What purpose do the LHINs really serve? The answer can be found in the orthopaedic crisis in the South West LHIN. There have been numerous articles written about this in the local newspapers. Of course, doctors provided joint replacements as quickly as they could to alleviate the suffering of their patients. Then the money ran out, and there are to be no more joint replacement surgeries for the rest of the fiscal year. The Ministry of Health's response? Have the LHIN take responsibility, and be the lapdog that attacks the doctors for daring to question the status quo. Also, keep arms-length distance from the situation (it's a local issue, that should be dealt with local governance). Thus, try to deflect the criticism from the MOH, and keep the mud from sticking to the health minister. Additionally, try to confuse the public with bureaucratic bafflegab. Seriously, in the article I linked to above, the argument made by Michael Barrett, head of the Southwest LHIN, is that the hospitals should have done the same number of surgeries, but spread them out over the course of a year. How would that help clear the backlog? You need to do MORE surgeries to reduce wait times, not the same number over a longer period of time. In essence, LHINs are set up to be a middleman with no real power, for the sole purpose of taking blame away from an elected politician. The cost? According to the Auditor General's report, about $90 million per year in 2015. 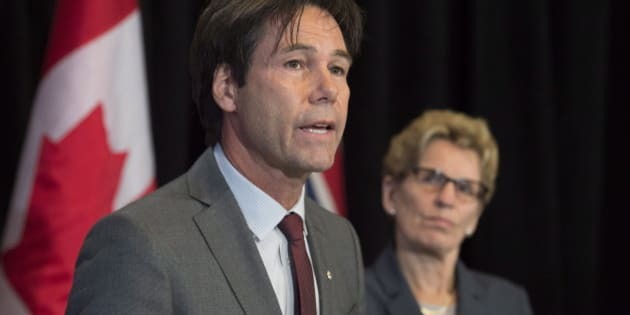 As an aside, don't you think it's funny that Eric Hoskins repeats the lie that doctors have had a 61 per cent raise since 2003, but ignores the fact that LHIN costs have gone up 30 per cent since 2012 alone? Especially since LHINs are, as PC House Leader Jim Wilson points, out, all bureaucracy? You know what else would cost the taxpayer $90 million dollars a year? If the average cost of a nurse is $75,000 per year, you could instead hire 1,200 nurses. At an average cost of $25,000 per joint replacement you could do 3,600 more joint replacements a year. Goodness knows how many PSWs you could get for that, or how much more home care services would improve with that amount of money. It's time to eliminate LHINs.